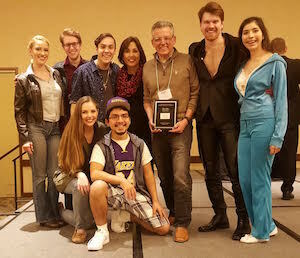 Seaver College students in the Flora L. Thornton Opera Program were awarded first place in the Opera Division I category of the National Opera Association’s Collegiate Opera Scenes Competition at the annual national convention held in Santa Barbara on Thursday, January 5. The Opera Division I award is reserved for productions featuring performers between the ages of 18 and 22, and is thus primarily granted to undergraduate students. Other national finalists for the award were students from Samford University, Central Washington University, and University of Nebraska Omaha. Finalists were selected by blind video submission. The talents of several Pepperdine faculty members were also demonstrated throughout the production, including stage direction from Opera Program director and music professor Henry Price III, musical direction from adjunct professor Andy Gladbach (’14), associate professor of music Louise Lofquist (who also served as pianist), and visiting instructor David Wilkinson, as well as costume designs from Melanie Watnick. Price was additionally presented with the National Opera Association’s “Lifetime Achievement Award” at the annual convention on Saturday, January 7. The award honors lifetime contributions to the field of opera. Previous awardees include operatic greats Samuel Ramey, Robert Merrill, Marilyn Horne, Sherrill Milnes, and Beverly Sills. Sophomore Soibelman and alumnus Rudy Giron (’14) were national finalists at the Vocal Competition held at the event. Giron also received the “Legacy Award,” a special award presented to the leading minority student in the competition. The Opera Program’s complete production of Don Giovanni will be presented at Smothers Theatre on the Pepperdine University Malibu campus on Thursday, February 23, and Saturday, February 25, at 7:30 PM. For additional information about the upcoming performances, and to purchase tickets, visit the Center for the Arts website.